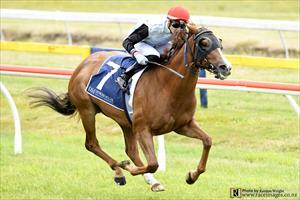 4.50 p.m. R7 3 The Boy Wonder (3 c Cape Blanco – Keep the Passion, by Keeper) – Jake Bayliss; ran a strong second in the 3YO Salver (Listed, 2100m) on 17 December at Ellerslie, and following a sixth over 1500 metres he again steps in distance for the $100,000 Waikato Guineas (Gr. 2, 2000m). A second up winner here over a mile in November, hopefully he produces a solid performance with luck from barrier 11. Fixed odds: $14.00 & $4.00. 5.27 p.m. R8 4 Ali Baba (5 g Savabeel – Dreamworks, by Maroof) – Jake Bayliss; was a touch disappointing at Tauranga, but came through the race okay and contests the $25,000 Rating 75 1600 metres. Ideally drawn (4), he generally goes well here and receives an opportunity to improve despite a strong field. Fixed odds: $18.00 & $4.50.